This article is about the monarch of the ancient Roman Kingdom. For the medieval title under the Holy Roman Empire, see King of the Romans. For Napoleon I's son and heir, see Napoleon II. For the racing pigeon, and the song about it, see The King of Rome. The King of Rome (Latin: Rex Romae) was the chief magistrate of the Roman Kingdom. 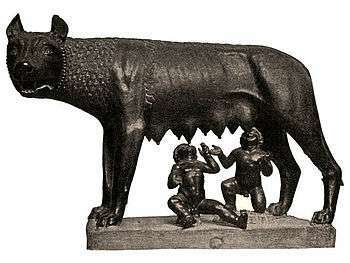 According to legend, the first king of Rome was Romulus, who founded the city in 753 BC upon the Palatine Hill. Seven legendary kings are said to have ruled Rome until 509 BC, when the last king was overthrown. These kings ruled for an average of 35 years. 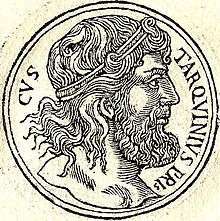 The kings after Romulus were not known to be dynasts and no reference is made to the hereditary principle until after the fifth king Tarquinius Priscus. Consequently, some have assumed that the Tarquins and their attempt to institute a hereditary monarchy over this conjectured earlier elective monarchy resulted in the formation of the republic. Early Rome was not self-governing, and was ruled by the king (rex). The king possessed absolute power over the people. The senate was a weak oligarchy, capable of exercising only minor administrative powers, so that Rome was ruled by its king who was in effect an absolute monarch. The senate's main function was to carry out and administer the wishes of the king. After Romulus, Rome's first legendary king, Roman kings were elected by the people of Rome, sitting as a Curiate Assembly, who voted on the candidate that had been nominated by a chosen member of the senate called an interrex. Candidates for the throne could be chosen from any source. For example, one such candidate, Lucius Tarquinius Priscus was originally a citizen and migrant from a neighboring Etruscan city-state. The people of Rome, sitting as the Curiate Assembly, could then either accept or reject the nominated candidate-king. The insignia of the king was twelve lictors wielding the fasces, a throne of a Curule chair, the purple Toga Picta, red shoes, and a white diadem around the head. Only the king could wear a purple toga. Head of State served as the chief representative of Rome in its relations with foreign powers and received all foreign ambassadors. Head of Government served as the chief executive with the power to enforce the laws, managed all state owned property, disposed of conquered territory, and oversaw all public works. Commander in Chief commander of the Roman military with the sole power to levy and organize the legions, to appoint military leaders, and to conduct war. Chief Priest served as official representative of Rome and its people before the Roman gods with the power of general administrative control over the Roman religion. Chief Legislator formulated and proposed legislative proposals as he deemed necessary. Chief Judge adjudicated all civil and criminal cases. What is known for certain is that the king alone possessed the right to the auspice on behalf of Rome as its chief augur, and no public business could be performed without the will of the gods made known through auspices. The people knew the king as a mediator between them and the gods (cf. Latin pontifex "bridge-builder", in this sense, between man and the gods) and thus viewed the king with religious awe. This made the king the head of the national religion and its chief executive. Having the power to control the Roman calendar, he conducted all religious ceremonies and appointed lower religious offices and officers. It was Romulus who instituted the augurs and who was believed to have been the best augur of all. Likewise, King Numa Pompilius instituted the pontiffs and through them developed the foundations of the religious dogma of Rome. Beyond his religious authority, the king was invested with the supreme military, executive, and judicial authority through the use of imperium. The imperium of the king was held for life and protected him from ever being brought to trial for his actions. As being the sole owner of imperium in Rome at the time, the king possessed ultimate executive power and unchecked military authority as the commander-in-chief of all Rome's legions. His executive power and his sole imperium allowed him to issue decrees with the force of law. Also, the laws that kept citizens safe from the misuse of magistrates owning imperium did not exist during the times of the king. Another power of the king was the power to either appoint or nominate all officials to offices. The king would appoint a tribunus celerum to serve as both the tribune of Ramnes tribe in Rome but also as the commander of the king's personal bodyguard, the Celeres. The king was required to appoint the tribune upon entering office and the tribune left office upon the king's death. The tribune was second in rank to the king and also possessed the power to convene the Curiate Assembly and lay legislation before it. Another officer appointed by the king was the praefectus urbi, which acted as the warden of the city. When the king was absent from the city, the prefect held all of the king's powers and abilities, even to the point of being bestowed with imperium while inside the city. The king even received the right to be the sole person to appoint patricians to the Senate. The king's imperium granted him both military powers as well as qualified him to pronounce legal judgment in all cases as the chief justice of Rome. Though he could assign pontiffs to act as minor judges in some cases, he had supreme authority in all cases brought before him, both civil and criminal. This made the king supreme in times of both war and peace. While some writers believed there was no appeal from the king's decisions, others believed that a proposal for appeal could be brought before the king by any patrician during a meeting of the Curiate Assembly. To assist the king, a council advised the king during all trials, but this council had no power to control the king's decisions. Also, two criminal detectives (Quaestores Parridici) were appointed by him as well as a two-man criminal court (Duumviri Perduellionis) which oversaw for cases of treason. Under the kings, the Senate and Curiate Assembly had very little power and authority; they were not independent bodies in that they possessed the right to meet together and discuss questions of state. They could only be called together by the king and could only discuss the matters the king laid before them. While the Curiate Assembly did have the power to pass laws that had been submitted by the king, the Senate was effectively an honorable council. It could advise the king on his action but by no means could prevent him from acting. The only thing that the king could not do without the approval of the Senate and Curiate Assembly was to declare war against a foreign nation. These issues effectively allowed the King to more or less rule by decree with the exception of the above-mentioned affairs. Whenever a Roman king died, Rome entered a period of interregnum (literally: between kings). Supreme power in the state would devolve to the Senate, which had the task of finding a new king. The Senate would assemble and appoint one of its own members as the interrex to serve for a period of five days with the sole purpose of nominating the next king of Rome. After the five-day period, the interrex would appoint (with the Senate's consent) another Senator for another five-day term. This process would continue until the election of a new king. Once the interrex found a suitable nominee for the kingship, he would bring the nominee before the Senate and the Senate would review him. If the Senate passed the nominee, the interrex would convene the Curiate Assembly and preside as its president during the election of the King. Once a candidate was proposed to the Curiate Assembly, the people of Rome could either accept or reject the candidate-king. If accepted, the king-elect did not immediately enter office. Two other acts had still to take place before he was invested with the full regal authority and power. First it was necessary to obtain the divine will of the gods respecting his appointment by means of the auspices, since the king would serve as high priest of Rome. An augur performed this ceremony: he conducted the king-elect to the citadel where he was placed on a stone seat as the people waited below. If the king-elect was found worthy of the kingship, the augur announced that the gods had given favorable tokens, thus confirming the king’s priestly character. The second act which had to be performed was the conferring of the imperium upon the King. The Curiate Assembly's previous vote only determined who was to be king, and had not by that act bestowed the necessary power of the king upon him. Accordingly, the king himself proposed to the Curiate Assembly a law granting him imperium, and the Curiate Assembly, by voting in favor of the law, would grant it. Since Rome's records were destroyed in 390 BC when the city was sacked, it is impossible to know for certain how many kings actually ruled the city, or if any of the deeds attributed to the individual kings, by later writers, are accurate. (aged 53) 753 BC 716 BC Proclaimed himself king after murdering his brother, Remus. (aged 80) 716 BC 672 BC Elected king by the Curiate Assembly, after the death of Romulus. TVLLVS HOSTILIVS REX ? – 640 BC 672 BC 640 BC Elected king by the Curiate Assembly, after the death of Numa Pompilius. 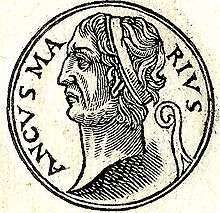 ANCVS MARCIVS REX c. 677 – 616 BC 640 BC 616 BC Grandson of Numa Pompilius; five years old at the time of his grandfathers' death, he was elected king by the Curiate Assembly after the death of Tullus Hostilius. LVCIVS TARQVINIVS PRISCVS REX ? – 578 BC 616 BC 578 BC After the death of Ancus Marcius, he became regent due to Marcius' sons being too young, but was soon elected king by the Curiate Assembly. He was the first Etruscan king, and was originally known as Lucumo. SERVIVS TVLLIVS REX ? – 534 BC 578 BC 534 BC Something like the adoptive son of Lucius Tarquinius Priscus; seized the kingship after Ancus' sons had Tarquinius Priscus assassinated under the guise that he was merely filling in while the king was recovering. LVCIVS TARQVINIVS SVPERBVS REX ? – 495 BC 534 BC 509 BC Son or grandson of Lucius Tarquinius Priscus; seized the kingship after the assassination of Servius Tullius which he and his wife (daughter of Tullius) helped orchestrate. 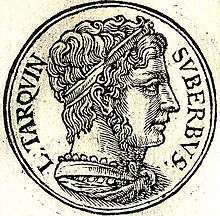 The overthrow of the Roman monarchy of Tarquinius Superbus led only in a very limited way to the separation of the powers mentioned above. The actual title of king was retained for the rex sacrorum, who formally remained Rome's first priest. He was forbidden any political or military career, except indeed a seat in the senate. However, the Roman desire to hinder the kingship from becoming important went so far that even in the area of religion the king of sacrifices was formally in all but protocol subordinated to the first of the pontiffs, the pontifex maximus (whose position in origin, rather than with the name of priest, is better described as "minister of religion"), to the point that at some point in history, the regia or royal palace at the Forum Romanum, originally inhabited by the king of sacrifices, was ceded to the pontifex maximus. Significantly enough, one of his major appearances in the public scene was the festival of Regifugium, where he impersonated the king in his being thrown out of the city; also, the consuls themselves retained religious roles vital enough that the office of interrex was retained for the opening prayer of electional assemblies in case that both consuls had died in office, and the ritual of driving a nail into the temple of Jupiter sometimes even induced a dictatorship. Nor was the rex sacrorum elected publicly, but chosen by the pontifical college. The king of sacrifices retained some religious rites only he could perform, and acted as quasi-flamen to Janus. He seems to have existed until the official adoption of the Christian religion. To qualify for the office, patrician ancestry was necessary; however it was once performed by a member of a family otherwise known as plebeian, the Marcii, earning for himself and his descendants the cognomen Rex. As has been mentioned, the administrative functions in religion, including at some point the housing in the ancient royal court, were ceded to the supreme pontiff. The previous role of the king in choosing new senators and dismissing people from the senate was ceded to the censors, albeit in the late republic, the first of these functions was rather limited as all magistrates down to the rank of quaestor gradually had gained admission to the senate after the office's expiration. The modern concept of a head of state, insofar as the republican times excepting the dictatorships are concerned, can hardly be translated to Roman conceptions, but basically all other powers—the imperium—were ceded to the consuls (the etymology suggests that these were originally the king's chief counsellors) and, after the creation of the office (about 367, according to Livy, thereby at least roughly separating the judiciary from the executive), the praetors ("leaders"). According to tradition (which is disputed by historians for the first decades), the consulate was however always entrusted to two persons for hindering dominance; for emergency situations a dictatorship was introduced. Later, also proconsuls and propraetors could be given an imperium by appointment of the senate. Whoever used the imperium to victoriously lead an army could acquire the title of imperator, which later became chief title to the emperors, who were technically included in the system as proconsuls over most (and the strategically most important parts) of the empire, chief senators, and popular tribunes without the title. The republican idea that all promagisterial imperium ends upon entering the city was not observed in the emperors' case. At the same time, the legislation was practically passed from the Curiate Assembly to the Centuriate Assembly (and Tribal Assembly), exception the more-or-less formality of a lex curiata de imperio which ratified the elections of the previous Centuriate Assembly. The consuls did however retain the power to rule by ordinance. 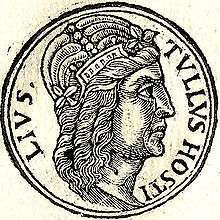 ↑ Titus Tatius, King of the Sabines, was also joint king of Rome with Romulus for five years, until his death. However he is not traditionally counted among the seven kings of Rome. ↑ Gary Forsythe, A Critical History of Early Rome: From Prehistory to the First Punic War (University of California Press, 2005), p. 136 online. 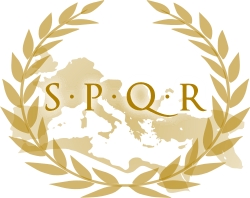 ↑ Before the formal establishment of the office of praetor below the consulate, this was at least another generic name, and quite possibly another title, of the consuls, cf. the names "praetorium" for the military leader's tent etc.